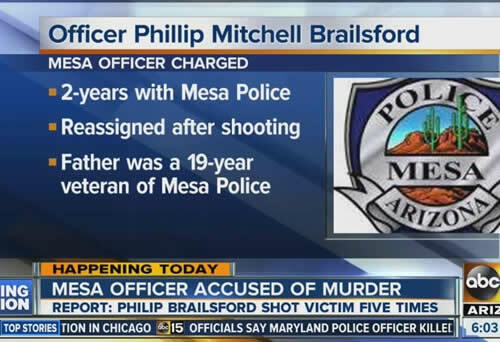 Mesa, Arizona, police officer Philip Mitch Brailsford has been charged with second-degree murder in the January 2016 shooting death of an unarmed man. Officer Philip “Mitch” Brailsford, 25, was charged with murder on March 4 in the shooting death of Daniel Shaver, a 26-year-old husband and father of two from Texas. Officer Philip “Mitch” Brailsford preparing to go to trial for shooting and killing an unarmed man in a hotel hallway last year is now arguing that it would be “unfair” to show the jury body cam footage of the shooting. But the footage is probably the strongest piece of evidence that will determined whether or not Mesa police officer Philip “Mitch” Brailsford truly feared for his life when he shot and killed Daniel Shaver after ordering him to come crawling towards him on January 18, 2016. A Mesa Police Department internal report found that the words “You’re f–ked” were inscribed on the on the dust cover of the AR-15 patrol rifle Officer Philip “Mitch” Brailsford used to murder 26-year-old Daniel Shaver. State prosecutors argued that the words were a testament to Officer Philip “Mitch” Brailsford’s mindset at the time of the incident. Officer Philip “Mitch” Brailsford, 26, shot Shaver five times as unarmed Shaver was on his knees outside his hotel room, begging, “Please don’t shoot me,” according to police records. Shaver had moved his hand to his waistband just before the gunfire, which Officer Philip “Mitch” Brailsford reportedly feared was a reach for a weapon. An Arizona judge finally released body cam footage from the shooting death of Daniel Shaver, which led to murder charges against Mesa police officer Philip “Mitch” Brailsford. However, the videos are edited, removing the actual shooting of the unarmed man who died begging for his life. But we already know Officer Philip “Mitch” Brailsford shot and killed Shaver after he was ordered to crawl towards police on his hands and knees. 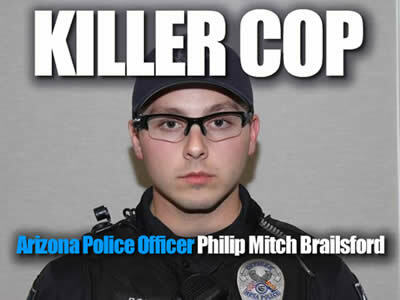 And we already know that Officer Philip “Mitch” Brailsford was the only officer out of six that felt compelled to shoot. Officer Philip “Mitch”Brailsford later told investigators that it was a “terrifying” experience for him as he watched the unarmed man crawling towards him – essentially saying he was in fear for his life. But it was Shaver who was in fear for his life. “Please don’t shoot me,” Shaver said according to a witness, who was also ordered to crawl towards police.